Increase quantity of honey to 1 tbsp for a delicious honey mustard condiment. Add half (45 g or 1.6 oz) of the yellow mustard seeds and all of the black mustard seeds to the mixer bowl. Blitz for 4 sec/speed 9/MC on. Add remaining ingredients and combine for 5 sec/speed 3/MC on. Let the mustard sit on your bench for 24-48 hours and then refrigerate. It will be runny to begin with, but will thicken over the 24 hours. Tip: Taste it as the flavour develops, and refrigerate it when it tastes how you prefer. The longer you let it develop, the less bitey. Makes roughly 125 g worth. 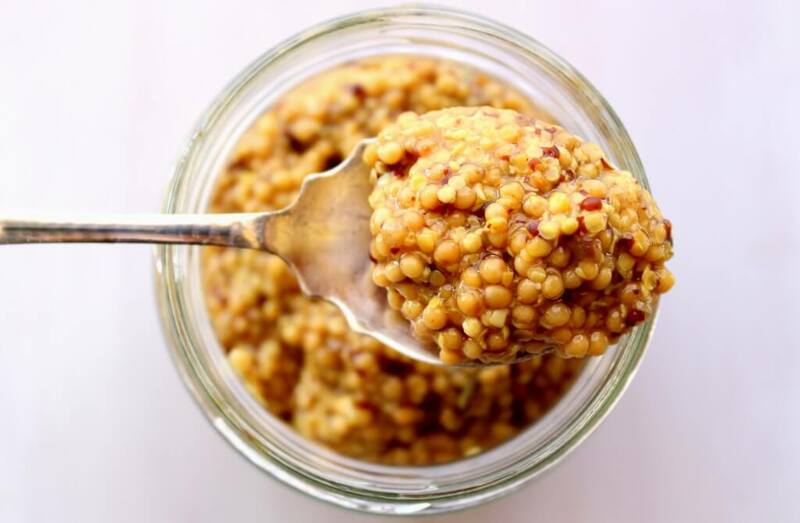 This mustard will last in your fridge for at least 3 months. 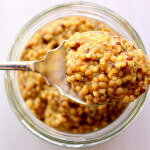 If you prefer a hotter mustard, increase the quantity of black mustard seeds proportionately (these are hotter). If you prefer a smooth mustard, blend on speed 8 until desired consistency is reached. I recommend you buy your mustard seeds at a bulk herbs and spices store or try an indian/asian grocer so that this is a budget recipe. This is HCG Protocol & LCHF compliant. Just wow! Why haven’t I made this before? 9 sec of mixing so quick!! Quick and easy to make. Great tasting too. Do you think rice malt syrup would substitute for sweetener okay? So quick and easy to make. I’m thinking this will make an awesome addition to a Christmas hamper too. Love it. How long will it keep in the fridge please? Sorry – now read your post properly, no need to reply!! Second with more brown seeds to be hotter.. Yum. And used maple syrup in second batch.. Delicious.. Thanks Nik as this is on my list to try using xylitol!